“The wide variety of gardens, parks and promenades comes as a surprise to the visitor from outside the Münsterland”. Remarks such as these by the Swiss landscape architect Günther Vogt are often heard when garden lovers from other places get to know the region. While the Münsterland does indeed have extremely impressive examples of garden design in the form of gardens and parks like those at Schloss Nordkirchen, the “Westphalian Versailles”, its distinctive features and typical qualities are often only recognised at second glance. Here the landscape shapes the gardens and the gardens shape the landscape. The Münsterländer Parklandschaft epitomises a mainly agrarian and extremely structured region consisting of numerous individual farmsteads surrounded by meadows, pastures, fields, embankment hedges and small woods. It is, however, simultaneously a PARK landscape. The numerous moated castles and palaces along with their gardens and parks are scattered in the landscape like jewels, giving the whole area a special charm. Architecture, park and landscape combine here to create a unique mosaic. This structure is supplemented by public green spaces in the towns and municipalities. Münster’s Promenade, for example, a 4.5 km chain of individual high-quality open spaces, is a unique green area for recreation and relaxation around the old historical town centre. The embankments and promenades, the historical graveyards, the town squares and town parks of the municipalities make the whole Münsterland and its park landscape a particularly attractive region in which to live. The proverbial rootedness of the population has contributed to the preservation of this valuable cultural landscape. Agricultural structures, which have developed over centuries, form the basis for high-quality regional products today. These products add to the variety of what is on offer in the area, either directly from their place of production or via short marketing paths. Collaboration between individual suppliers in quality circles such as Slow Food or the initiative of farms to market their products directly exemplify the attempt to use regional characteristics to counteract the international standardisation which is generally common today. Co-operation with Slow Food and other initiatives within the framework of the EGHN network represent the new approach of enabling the visitor to enjoy the heritage of (garden) culture in the Münsterland along with the valuable asset of high-quality regional products. The Münsterland is a mosaic-type landscape covering 6,000 km2 in the north-west of North Rhine-Westphalia, between the Teutoburger Wald and Lippe, the Emsland of Lower Saxony and the Netherlands. The area’s typical buildings include churches, monasteries, storehouses, moated farmsteads and moated castles. The numerous individual farmsteads surrounded by meadows, pastures, fields, embankment hedges and small woods give the Münsterländer Parklandschaft (Münsterland Park Landscape) its unique charm. Approximately 1.6 million people live in its 66 towns and municipalities. The “Westphalian metropolis” of Münster with approximately 270,000 inhabitants is the vibrant heart and centre of the region. In an international competition in 2005, Münster received an award as one of the best towns of the world to live in, not least because of its outstanding network of open spaces. The citizens of the Münsterland countered old biases long ago and have responded to the demands of international tourism with a modern infrastructure. The area has hence been a first choice for tourists for many years, even amongst those who are not cyclists. Nature, culture, innovative science, modern industry and a stable structure of medium-sized companies combine to form a strong region. Approximately 40,000 students are enrolled at the third biggest university in Germany, the Westfälische Wilhelms-Universität. A well-developed infrastructure and a wide variety of companies from fields such as mechanical engineering, chemistry, textiles, food production and environmental technology offer work and an excellent quality of life for the population. The marketing of high-quality regional products has been practised here for a long time and is of increasing importance. The Münsterland has become a Mecca of equestrian sport. Nowhere else are there so many institutions dealing with horses. Olympic winners, European champions and world champions from all equestrian disciplines and of all ages come from here. The region does not have any particularly spectacular sights. It is, rather, a treasure trove of gems. Numerous grand houses and moated castles, mostly off the main roads, play their role in creating a castle landscape which combines with the park landscape. The “100-Castle Route” is one of the most popular routes for a tour of the area. 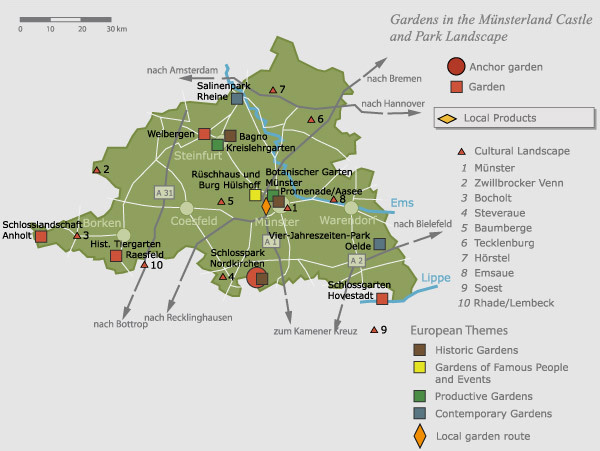 The REGIONALE 2004 of North Rhine-Westphalia helped to increase awareness of the garden culture of the region. The Landschaftsverband Westfalen-Lippe brought the potential of garden culture in eastern Münsterland to the attention of a broad public for the first time with the project “Historische Gärten und Parks links und rechts der Ems” (“Historical Gardens and Parks to the left and right of the Ems River”). With the ensuing project “Gartenreich(es) Westmünsterland” (“Westmünsterland’s Wealth of Gardens”), the complete Münsterland and the charms of its gardens will be documented over the coming years. The results of these projects will be added to the European Garden Heritage Network (EGHN), thereby linking the garden culture of the Münsterland into the European garden network. The gardens and parks in the Münsterland have remained hidden treasures for many decades and it is only in recent years that awareness of them has gradually grown. Although gardening has been a favourite pastime in Germany for a long time, questions regarding the history of garden design in the Münsterland essentially remained the domain of specialists. This has changed considerably in recent years, as is evidenced, e.g. by publications issued and events and tours organised by associations such as the Landschaftsverband Westfalen-Lippe and, more particularly, the Westfälische Amt für Landschafts- und Baukultur . Garden design has been (somewhat) less the focus of attention in Westphalia in the recent past. While buildings such as moated castles and palaces are well-known places for Sunday outings in the Münsterland, the gardens and parks are rarely perceived as examples of garden design with a value in their own right. Yet the Westphalian nobility greatly prized impressive gardens, as can be seen from examples from the Baroque period such as Park Burg Hülshoff, Schlosspark Nordkirchen and Bagno-Park. From the 18th century onwards, at the time of absolutism, one finds magnificent achievements in garden design. Unfortunately, these often only exist today in the form of plans. At that time, the nobility and clergy often created gardens and parks which stretched out into the countryside via avenues and woods (e.g. Schlosspark Nordkirchen). In the Münsterland, “historical deer parks” were often attached to the main gardens (e.g. Historischer Tiergarten Raesfeld), and these continue to exist today. At the time of the Enlightenment in the second half of the 18th century and in the 19th century, there was a change in gardens ideals, entailing a shift from strictly geometrical forms to a more natural, landscape-like style. The emergence of the bourgeois ideals of education during the 19th century moved the focus of attention onto the creation of Volksgärten (public parks), which were accessible to the general public. This trend also occurred in the Münsterland (e.g. Botanischer Garten Münster). The urbanisation of large towns such as Münster made green spaces necessary as areas for recreation. In smaller towns (Warendorf, Beckum), urban green spaces with monuments and memorials were created. At the end of the 19th century and in the early 20th century, styles of design which had been largely distinct and clearly defined up to that point were blended to create a pluralism of styles. This still marks the appearance of many gardens and parks today, including those in Westphalia. In the 1980s, the “natural garden” emerged, a new garden style strongly influenced by the ecological movement, where aesthetics played a background role and made way instead for small artificial biotopes (e.g. Emsauenpark in Telgte). In recent years, there has been a stronger trend again towards parks with a formal design. Broken geometrical forms often provide the basic idea for the design here (e.g. in Salinenpark Rheine and Vier-Jahreszeiten-Park Oelde). The Landschaftsverband Westfalen-Lippe aims to highlight and focus on the historical cultural value of the gardens and parks in the future, including those in other regions of Westphalia, and to use this to support regional development. Ultimately, garden design is an element of cultural heritage from which everyone can benefit in some way, whether it be in terms of ideals, culture or economics. This applies to visitors, municipalities and regions, neighbours and citizens as well as to garden owners. Private garden owners in the Münsterland in particular have shown a great willingness to play an active role in preserving their gardens, in some case opening them to the public (e.g. Schlosspark Anholt, Schlosspark Hovestadt, Gardens at Haus Welbergen).